This post is how to run ANSYS Electromagnetic solvers (HFSS/Maxwell) on TotalCAE Private and Public cloud. See our additional posts on CFX, Mechanical, and Fluent/Icepak. 2. Post Process on the Visualization Server using standard ANSYS Electromagnetics Desktop. 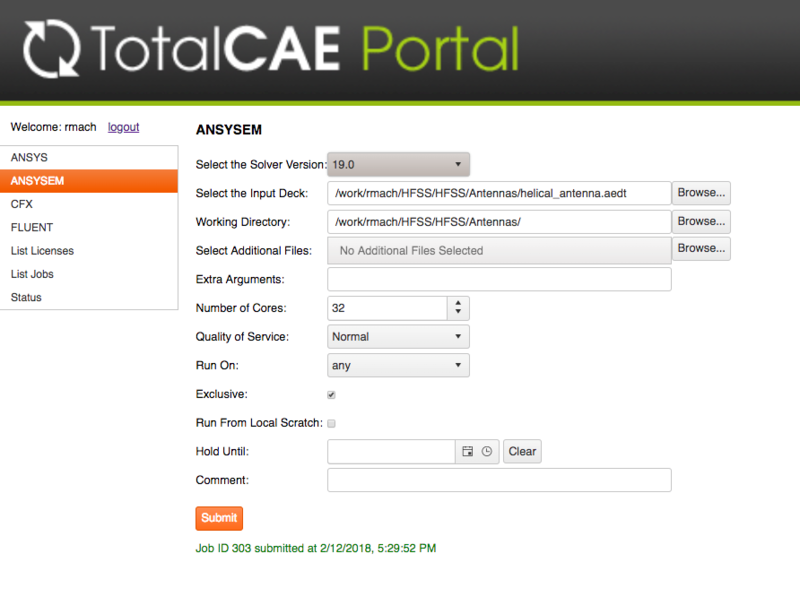 To use ANSYS Electromagnetics in batch mode, login to the TotalCAE portal (from your Windows PC with Chrome, or from the Visualization Server and launch Firefox) and select ANSYSEM. 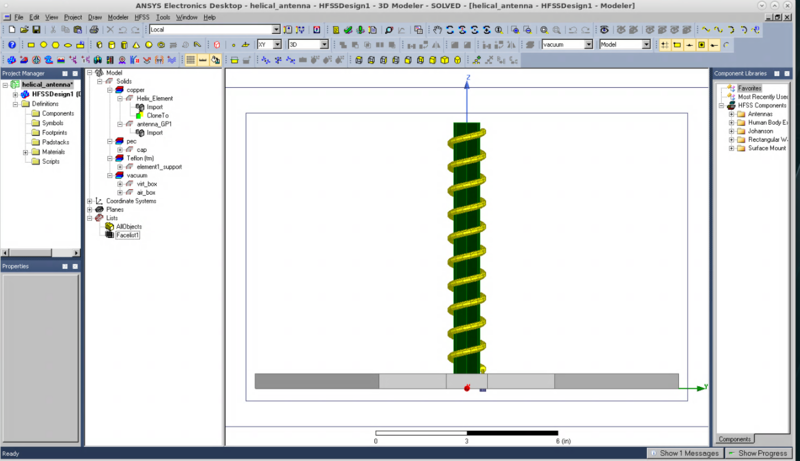 Choose the version of ANSYS Electromagnetics to run ( in this example version 19.0), then click Browse to upload a model from your machine to the HPC system. Your data will reside in /work/<username>/ on the cluster. You can do file upload/download through the portal, or by logging into the cluster with SSH to the head node of the system. 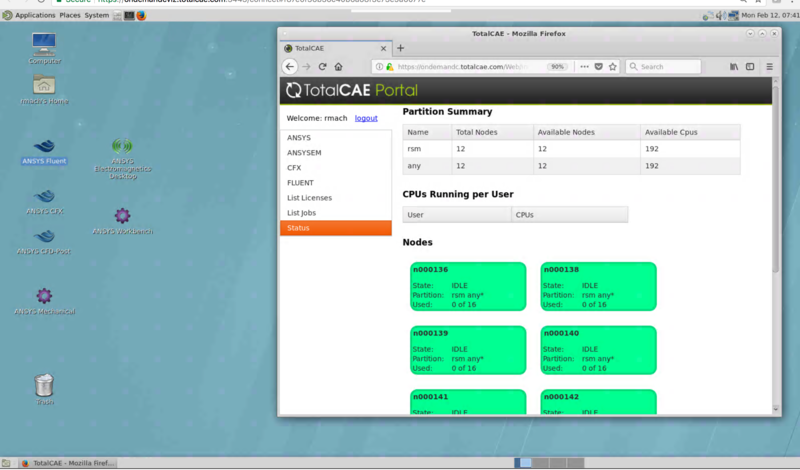 You can either download the results back to your workstation, or you can just visualize the results on the cloud via TotalCAE visualization server web page, and bring up ANSYS Electromagnetics Desktop in the resulting window). Some customers prefer to use submit jobs through ANSYS Remote Solve Manager (RSM) instead of the TotalCAE Portal. ANSYS RSM is configured as part of the HPC private or public cloud, and your user account already has been configured to use RSM through the TotalCAE Viz Server. The first step is to login to the TotalCAE Viz Server, and click on the “ANSYS Electromagnetics ” icon on your desktop. 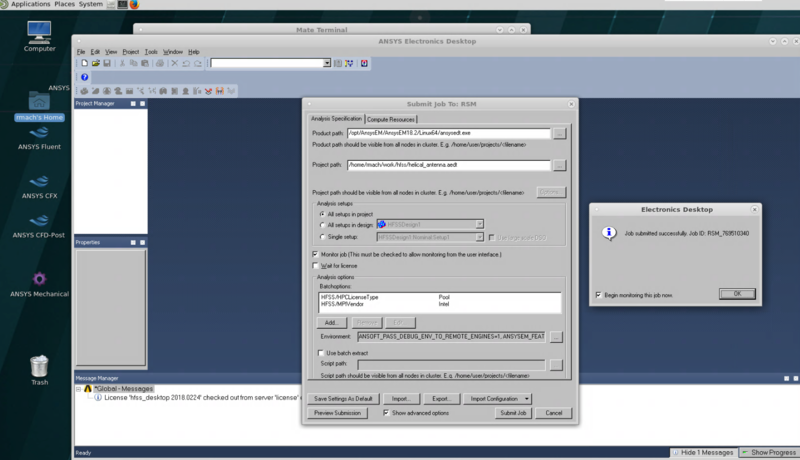 That will bring up the ANSYS Electronic Desktop GUI. A complete example is below, I get two nodes exclusively and am assigned a job ID of 321 from the scheduling system. I then use this job ID to bootstrap the RSM software on the nodes. 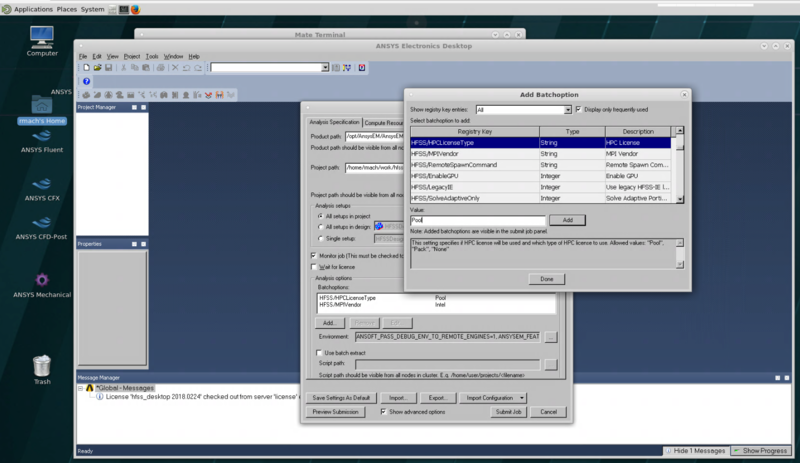 Now you are ready to configure ANSYS Electronics Desktop to use your assigned nodes. Launch Electronics Desktop, load your model and go to HFSS Menu and choose Submit Job. Click on the Compute Resource tab to configure the hosts assigned to you in the previous step like below. In this example, I was assigned nodes name n000136 and n000138 from the scheduler, so I have configured RSM to use those two nodes. Then back on the Analysis Specification tab, you will need to adjust your batch options to include ANSYS licensing type (for example Pack or Pool), as well as the MPI Vendor (choose Intel if on Azure). To return the nodes back to the scheduler so they can be turned off.